odd one out?. . Wallpaper and background images in the Harry Potter vs Twilight club tagged: bella hermione eowyn susan. ^ You just made this 20 times funnier. Three great women from three great fantasies... and then there's Bella. Let's see...Hermione (Awesome), Eowyn (Awesome), Susan (Awesome)...Bella (Nothing). 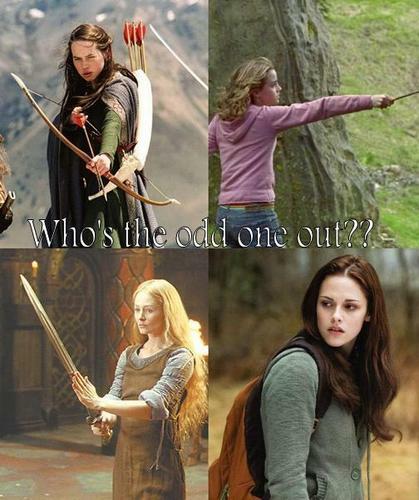 How can you even compare Bella to other woman fantasy characters? I guess she can drown you with tears or make you comite suicide by turning you depressed. They are all independant, the actors have emotion, and they are all beautiful. The no good Marysue that gives vampires, werewolves, and emos bad names.